A lot of people have been asking for this, and I thought it would help a lot of new members, so I decided to write this guide. It is by no means complete, and this should be considered a community effort. Let's begin with the baddies. If you want to hear about good companies, I suggest you skip this section. Do not buy from any of the following companies. If you want to see good companies, skip this section. The following companies will send you defective lasers, refuse to accept returns when they break, vastly overestimate their power, steal your money, and/or kill your dog. This company is guilty of... a lot of things. This is at maximum, a 2W laser, worth $100 or so. Yet they set its initial price at a ludicrous $7999, "SAVE 93%! ", overprice it by 500%, and then claim it's 10 watts. A 10W 445nm diode does not even exist as of July 2016. So this company is a clear scam. They also put out some pretty ridiculous videos. This company is a known scam. This is a 301 laser. It goes for $8 on eBay. This guy wants to sell it to you for $40. Scam! He also used a forum member's images, without his permission, and claimed that they were of his own product. When I contacted him, he admitted to using for his products images he found on Google. 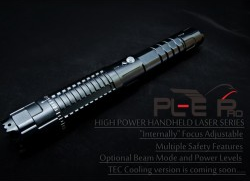 SITE: High power laser pointer store, LuckLaser focus on laser pointers. These sites are all selling LaserPointerPro type junk. DO NOT BUY FROM THEM! LaserGlow used to be a great company (a CNI reseller), but their prices have slowly risen over the years. They have stopped shipping >5mW lasers to the US, but international users beware. Better prices can be found almost anywhere! Wicked Lasers is old news now, but I thought I'd add them too. Products are overpriced and they lie A LOT. I've also a lot of horror stories from WL customers, including WL batteries exploding. The Arctic IS NOT, NEVER WAS, AND NEVER WILL BE the world's most powerful handheld laser. Now, on to the companies that are worth your time. 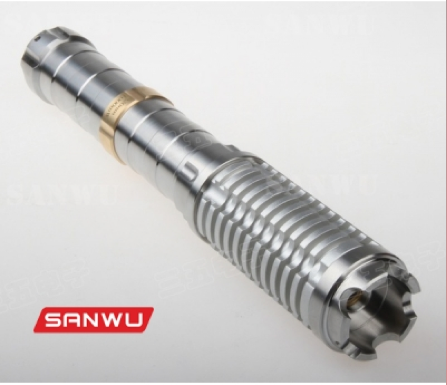 Sanwu is a great laser company, owned by a member of this very forum (Podo.) It's one of the first companies I recommend to new members who want high-powered lasers. They have very nice hosts, and lots of options. They even have multi-mode drivers with code locks! I've also heard good things about Podo's customer service. In general, I would say that Sanwu is the single best company for high-powered lasers. Their prices are reasonable and their products are top-notch. I've heard reports that they have practically unlimited duty cycle! They also have the ability to add a code switch (or a key switch) to their lasers, which is nice. MEDIAN SHIPPING TIME: 4 days! DragonLasers are known around here for being the main trustworthy seller of yellow DPSS lasers. I would say that my DragonLasers Spartan 589nm is probably the single best laser that I have in my collection. MEDIAN SHIPPING TIME: 2 days!! Optotronics is a US-based company, and from what I've heard, have some of the highest-quality lasers available anywhere. They also have excellent customer service - I have heard reports that the owner will even talk on the phone! We strongly recommend that you avoid this company for the time being. There has been a severe drop in quality as of late. XPL has been a relatively controversial company recently. I brought it to light a few months ago after purchasing 2 lasers from them. The owner, Peng, is extremely fast with customer service, and offers a 15% discount to LPF members *IF* you contact him before purchasing and inform him you're an LPF member. 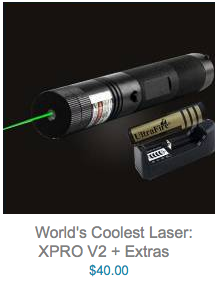 The best thing about this company, in my opinion, is the extremely high-power 532nm lasers. It's the only company I've ever seen with a 1.5W or 2W 532 in a handheld. The company also offers beam-combining RG:Y and RB:M lasers which are unavailable anywhere else. SITE: Welcome to O-like,the source of good quality laser products at unbeatable price and perfect service ! I'd say O-like is the best substitute for the typical Chinese/eBay type lasers. They're slightly more expensive but their quality is much greater than your usual eBay laser. If you want a starter laser, here's your place. Gearbest sells the standard eBay lasers (the ones sold by LaserPointerPro and the like) at non-inflated prices. A nice place to get a starter laser. My two Gearbest 532s are still up and running after 2 years! Lazerer sells fairly generic lasers, but not at inflated prices like those of LaserPointerPro. Another good choice for a starting laser. Please post your shipping times (entire time, from purchase to arrival) if you've bought from any of the companies listed. I want to create a reliable estimate for the shipping time of each company. Thanks! Well, that's about it for now. More companies will be added later. Again, if you've got any reviews for me to use, or any information to add, please post a comment! Thanks for putting this together - Maybe add O-like on there as trusted, they haven't outright scammed anyone and their prices/products are reasonable - maybe have a sort of "OK Companies" section that's in orange. They aren't bad but if you're looking for quality/speed they shouldn't be your first choice. I'm sure there are others we can put in that category too. Add these guys to the blacklist. Typical ripoff artists reselling $5 laser 303's and such for $40-50. I'd suggest adding optotronics to the 'good' companies section. They're located within the US and sell decent enough products. IMO I'd have a middle-ground category for companies such as O-Like and Lazerer. Both companies seem to send out decent enough products and reasonable prices. They're not top-of-the-line, but they're not ripoff companies IMO. Also you are missing Sky Tech lasers, one of LPF's sponsors. Not sure how reliable they are though, haven't seen many purchases from them. I will add optotronics, o-like, and XPL. Also you are missing Sky Tech lasers, one of LPF's sponsors. SkyTech is laserbtb with markup. Thanks for making this Sta and advertising the companies which simply want to take advantage of people who are just joining this hobby & don't yet understand the correct prices for different lasers! Credit for those two actually goes to GLR. I just posted them here after looking them over. Also it pains me to say this, but I'd personally recommend adding laserglow to the ripoff companies section. They used to be good, but they've fallen off a cliff lately and are hardly any better than ripoff companies now. I still recommend them to beginners sometimes because they have quality <5mw green pointers at an affordable price. However, I've looked at some of their other stuff and it left me wondering what kind of crack they're smoking. 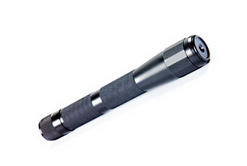 The Polaris is the world's most powerful visible-wavelength blue portable laser. Cutting-edge 447 nm laser diode technology brings power levels previously only possible using bench-top blue lasers at a fraction of the cost. :scowl:BULL CRAP:scowl: False advertising like this makes the old wickedlasers look reputable. 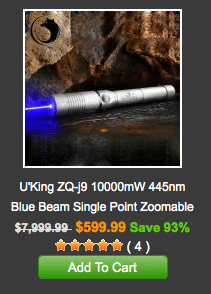 Only $1100 for the 1.2W "most powerful blue laser in the world"
I understand that their units are reasonably high quality being CNI made and all, but that's no excuse for lying and overcharging by such an amount. What happened to this company? IMO BLATANTLY lying about your products should get you added to the blacklist. They sell the same lasers as LaserBTB - service used to be good but haven't heard much about them as of late. I'm sure there are other threads on the topic. Thanks Hap, I will add your shipping times at once. Laserglow is old news by now. They no longer ship to the US, but I suppose I can add them. True, but this site has a lot of international users who might still get suckered by laserglow. I'd also add gearbest and kaidomain to the gray area companies. They aren't selling anything outrageously overpriced, but their products are still far from what I'd call quality. This thread is now....... "stickied"
Gearbest's prices are actually pretty good. I will probably add them to the category with O-like, XPL, and the like. Thanks hap. I just made a recent purchase from Skytech but only because they are having a clearance sale now. My shipping time was about a week and 3 days. Here is the review I did. If you do post it, I will edit it to make it a little better. Again thanks to everyone who helped, I had no idea my thread would lead to this but hopefully this will stop all those "Which Laser Should I Buy" threads. XPL is tricky... How should I describe them? I think we need more reviews to properly list XPL. It's still unknown how legit their 1W+ 532nm lasers will be. Right now seems like we're all waiting for them to finish their new hosts. Lazerer is another company that deserves mention imo. I've reviewed one of their products and it seemed perfectly legit and their prices are 'ok'. O-like seem to get stuff to me within 4-5 weeks of ordering. Sanwu takes 2-3 weeks usually. Lazerer took around 4 weeks. Laserbtb took around 3 weeks. Dragonlasers have VERY fast shipping if the product is in stock. Usually <1 week.